In 2011 I was having lunch with Eugene Corporon and I told him of a vision I had for a new percussion concerto CD. I was in the middle of writing Stubernic Fantasy (dedicated to Eugene), and I had also been reviewing all of the percussion concertos we had performed together with the North Texas Wind Symphony. The plan: to compile our recordings together along with Stubernic Fantasy to create a unique recording of percussion concertos for wind symphony. To our knowledge, this type of CD collection had never been done before. Eugene loved the idea! Not long after Corporon premiered and recorded Stubernic Fantasy with the Lone Star Wind Orchestra, a professional ensemble based in Dallas Texas. This recording was wonderful, but my plan was to have the North Texas Wind Symphony record the work so it could be included on this new CD. So we had to wait! 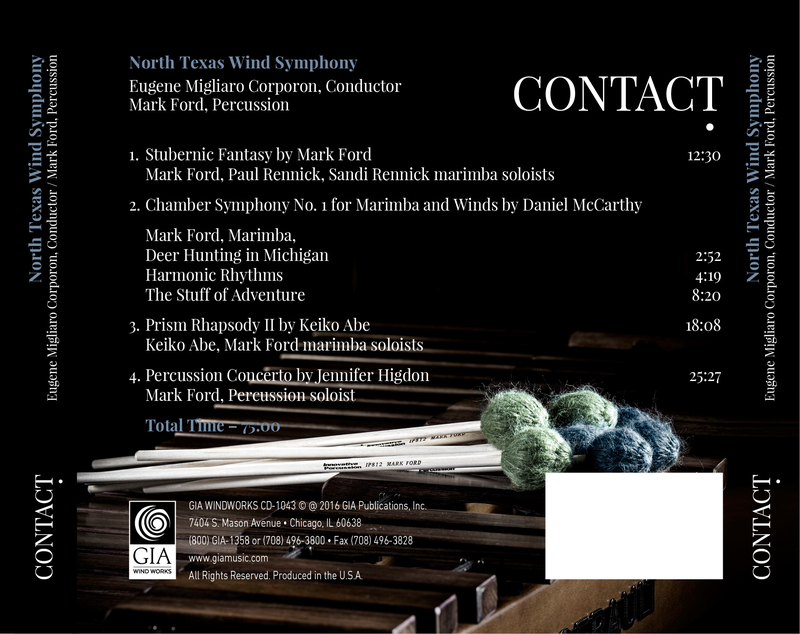 Several years later Stubernic Fantasy was scheduled for a North Texas Wind Symphony concert and recording in November of 2016 with soloists Paul Rennick, Sandi Rennick and me. The plan for the concerto CD was starting to have new life! So Ford decided to write a marimba concerto based on two of his most famous marimba works, Stubernic and Afta-Stuba! Both of these works feature three players on one marimba (a large beautiful percussion keyboard instrument with rosewood bars). In 1987 Ford’s friend, Stefan Stuber spent a year in Nicaragua doing humanitarian work. Ford was impressed with his friend’s devotion to helping others so he decided to write and dedicate a work to him. The title reflects Stefan’s last name, Stuber and “Nic” for Nicaragua resulting in “Stubernic” (pronounced stew-ber-nick). Ford states, “The music for Stubernic reflects the passion and excitement of the music of Latin America without borrowing any traditional themes or rhythms.” The work requires the three players to navigate all over the instrument even playing on the instrument’s frame and resonators. It is a powerful, driving work that has a fiery ending. Paul and Sandi Rennick and I are dear friends. Through their work together with the Santa Clara Vanguard Drum and Bugle Corps and UNT Paul and Sandi are a huge part of the percussive life in and around the College of Music. But I was very surprised to learn that Stubernic Fantasy was the first time that they had ever performed together! They are both incredible musicians and to say that they were a joy to play with is an understatement. We were fortunate to have UTEP Wind Ensemble Director Brad Genevro produce the recording as he had already recorded the work with Messiah College in Pennsylvania. McCarthy’s Chamber Symphony is challenging for the marimbist and I spent many hours trying to find the right approach and sound for this complex and haunting music. Written for 13 musicians and soloist, Sandi Rennick is the lone percussionist in the ensemble behind the marimba. We performed this work at a CBDNA hosted by UNT and Murchison Hall was completely full! I’ll never forget walking out onto the stage and seeing not only the main hall packed but also the choral terrace full of audience members behind me. There was such a great energy and spirit in the hall that night and the music just flowed. I wish we had a video of this performance! At the recording a few days later producer Jack Stamp helped to fine tune our performance into an amazing recording! I always seek to expand the musical possibilities of the marimba. In pursuit of these artistic possibilities I often explore adding additional marimba parts to my solo works. The idea for Prism Rhapsody II was born of the same desire. After having heard Katarzyna Mycka and Bogdan Bacanu perform my other works, I decided to compose Prism Rhapsody II for the duo and orchestra. It is my continual hope to nurture the musical possibilities of the marimba. I have had the pleasure of performing with Keiko Abe several times and each one is precious. As a friend and fellow musician, she is always in my heart. The last time we performed together was in 2014 in Poland where we premiered the duo version of Keiko’s Wave Concerto. I have learned so much from her and we have laughed and enjoyed our time together very much. The 20th century saw the development of the percussion section grow more than any other instrumental section in the orchestra or band world. Both the music and the performers grew in capability as well as visibility…the appearance and growth of the percussion concerto as a genre exploded during the later half of the century. When I am writing a concerto I think of the nature of the featured solo instrument. In the case of percussion, this means a large battery of instruments, from vibraphone and marimba, to non-pitched smaller instruments (brake drum, wood blocks, Peking Opera gong), and to the drums themselves. Not only does a percussionist have to perfect playing all of these instruments, but also he or she must make hundreds of decisions regarding the use of sticks and mallets, as there is an infinite variety of possibilities from which to choose. In addition there is the choreography of the player’s movements; where most performers do not have to concern themselves with crossing the stage repeatedly during a performance, a percussion soloist must have every move memorized. No other instrumentalist has such a large number of variables to challenge and master. The original Percussion Concerto was a joint commission by The Philadelphia Orchestra, The Indianapolis Symphony Orchestra, and The Dallas Symphony Orchestra. The wind transcription of Percussion Concerto was commissioned by The President’s Own Marine Band, Colonel Michael J. Colburn, director and performed by the band with Christopher Rose, as soloist, on May 10th, 2009. Higdon received a 2010 GRAMMY for Best Contemporary Classical Composition for her Percussion Concerto. I am still so impressed with the energy and multitude of colors in Jennifer Higdon’s concerto. This exciting music flows over the listener in a wave of sound that lifts and falls as the soloist explores many different instruments. I learned this work in stages with two different instrument set ups: the marimba and vibraphone with crotales and the percussion set up (drums, cymbals, toys). The physical demands on the soloist equals the musical results as the audience follows the path of the music. What a journey! In addition to these incredible selections, there will also be a bonus track for digital downloads: Ruffles From Afar by Yo Goto – a fantastic one-movement snare drum feature where I play American rudimental drumming as well as contemporary and jazz styles on two standard concert snare drums. It is an exciting work that brings historical drumming to the contemporary stage engaging the audience as the soloist enters from the back of the hall marching in with a rope drum and leaving in the same manner. 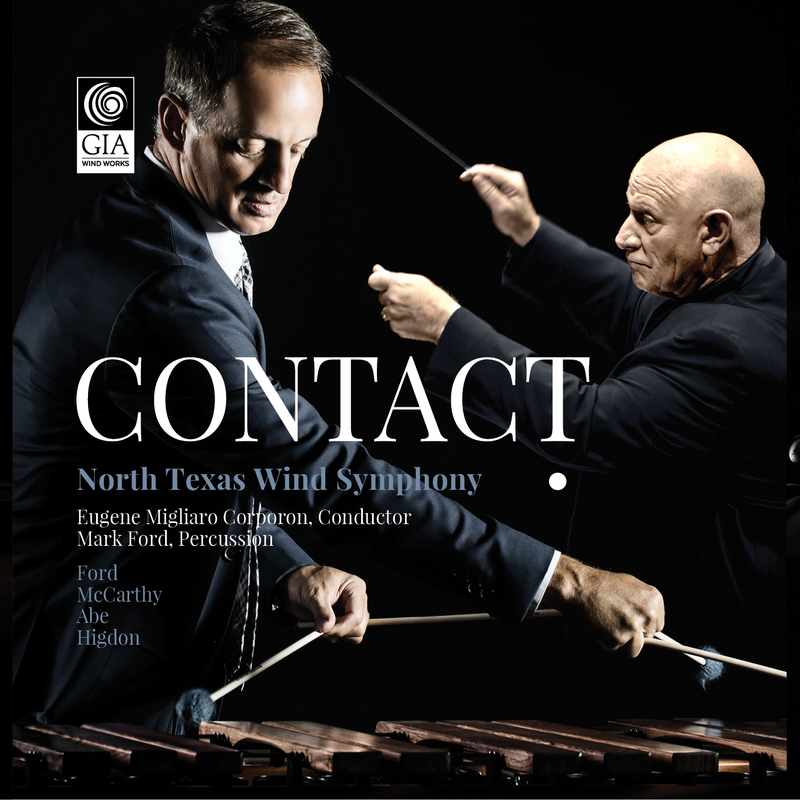 Contact celebrates my friendship with Eugene Corporon and many of my performances with the North Texas Wind Symphony. It is a special recording documenting our work together. Many of my fondest memories on stage have been with the North Texas Wind Symphony, and to have this disc become a reality is incredible! There are so many people to thank: Eugene Corporon, Dennis Fisher, Nicholas Williams, Alec Harris (GIA), Bruce Leek, Katarzyna Ziemba, Konzept Group (Art Layout), Kasia Jarosz Photography, Ryo Watanabe (for Corporon’s photograph), Jacqueline Townsend (CD booklet notes), Mark Schafer (Dynasty/Bergerault), Erik Johnson and George Barrett (Innovative Percussion), Keith Aleo (Zildjian), Jim Bailey (Evans), Paul Rennick, Sandi Rennick, Keiko Abe, Motoko Kobayashi, Daniel McCarthy, Jennifer Higdon, Yo Goto, Akiko Goto, Christopher Deane, Jack Stamp, Brad Genevro, Adam Gorb, Harold Jones, Clyde Hughes, Blair Liikala, Caleb Karrenbrock, the UNT Percussion Faculty, Dean John Richmond and the UNT College of Music, my sons Austin and Kevin Ford, my fantastic UNT students and all of the amazing musicians in the North Texas Wind Symphony. As always, every note of music is for my amazing wife, Ewelina, and our beautiful daughter, Emily. Life is beautiful!